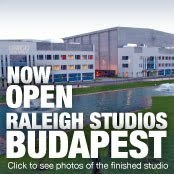 Raleigh Studios, one of the largest independent film studios in the United States, has opened a sprawling 40-acre complex on the outskirts of Budapest. The $75 million facility contains a 40,000 square foot soundstage that is among the biggest in Europe. It is all part of efforts to make the picturesque capital city of Budapest a kind of Hollywood on the Danube. The studio is attracting some major productions. The back lot is being used to replicated the opulent Hotel de Paris in Monaco for the film MONTE CARLO, co-produced by Nicole Kidman that is set for release next year. In the film, three Texas teenagers are throwin into the life of the fabulously wealthy when one of them is mistaken for a British heiress on vacation in Paris. The producers have said that by not actually shooting in France, they are saving millions of dollars. "Hungary has crews who have the same expertise as HOllywood, but it is much cheaper to shoot here", said Denise Di Novi, one of the film's producers. Another big budget production has been attracted to the new studios. BEL AMI, a historical romantic film starring Kristin Scott Thomas and Robert Pattinson, was shot in the city this past Spring and will be released next year. In addition, a cable television series called THE BORGIAS, about the infamous Italian renaissance family, will be shot in Budapest, with an all-star cast including Jeremy Irons. Renaissance Rome is being rebuilt on the studio lot but it is still less expensive than shooting in Rome itself. The collapse of the Hungarian construction industry brought on by the shaky local economy, meant that the production could afford to employ a small army of builders, whose wage demands were lower than in Western Europe. Hungary has been able to attract outside productions not only because of the cheaper wage, but because it is offering a very attractive tax rebate. A foreign film production receives a 20 per cent discount by partnering with a local Hungarian production unit. The local production company receives the rebate and can deduct the contribution from its income taxes while charging less for work costs. The Czech Republic and Romania have recently enacted similar tax rebate schemes. This is good news for the financially hard-hit former Eastern bloc, including Hungary, which recently had to appeal to the International Monetary Fund and the European Union for $25 billion in emergency financing. However, since introducing its financial incentive programs, Hungary has been able to attract bigger productions and keep local technicians and craftsmen working, while also promoting itself as Europe's sexiest production center.